Leave it to my friend Steve to start me down Flannery Avenue this late in the game. Officially, this is my first story of hers I have ever read. I’m sure that is appalling to some, and I simply can’t help that fact. Late literary puberty, folks. Nothing to see here. Anyway. there’s a haunting sort of wind that blows through this story, even though the reasoning and rationale aren’t even apparent. That–is usually no threat to the subplots in my own life–especially the kind of mischievous inspiration I can draw from other things. Enoch is a guy who is stuck in the rain with a substandard umbrella, lent to him by a landlady who doesn’t like him. Enoch also itemizes the fact that is luck is horrible, and misappropriated to the level of a curse. He sees a bunch of kids lined up at a theater, to shake hands with some otherworldly simian. Enoch lines up to shake hands with said ape. He notices a guy go into the back of the shipping truck,and presumably change into an ape suit, meant to deceive others. Finally getting the chance to see the ape, a muffled voice from inside the costume advises him that “going to hell” would be a most swell happening. Especially if he was the one doing the going. Enoch runs away, because this is what always happens to him. Enoch goes to eat at a diner, where a waitress there likes him about as much as cancer. Enoch sees a newspaper ad in which the heretofore mentioned ape is going to be making another appearance. Enoch sneaks into the truck, and jumps out at a slow juncture with the ape suit. Enoch put the ape suit on in the woods, made a bunch of animal noises, and then walked around. Enoch sat on a hill, looking at the city in the apesuit. I don’t know about anybody else, but this cul-de-sac of an odd, offbeat caper is enough to make me think I’m not taking my up-and-coming gorilla/Bigfoot endeavors seriously enough; there might be a secondary spiritual gravity to it–yeah, even one of coming-of-age self-actualization. Naw. But I will say this, that story is an odd one. Short, yet a tad haunting. 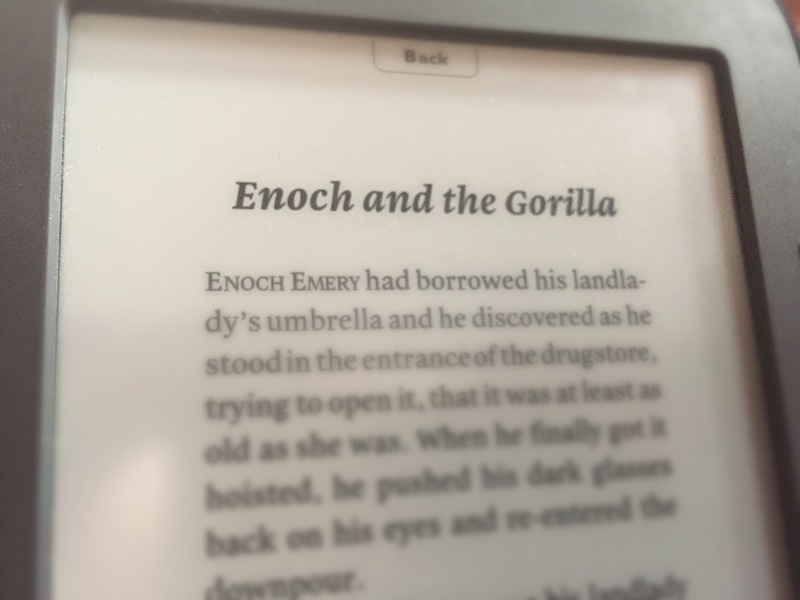 This entry was posted in Blogging, Reading, Writing and tagged Ape, Bigfoot, Enoch and th Gorilla, Flannery, O'Connor, Stories, Suit. Bookmark the permalink. You forgot the part where he finds the couple and holds out his ape hand to them. The man sees him and slips away quietly leaving the woman behind, while the woman turns to look and runs away screaming. Waitress – “Any way I don’t see you will be alright with me,” she said. I think all of her stories are haunting in some respect. That’s why it’s not good to read them right before you go to bed. I think you will thoroughly enjoy her writing.